I placed a UWTI trade because I wanted to understand the decay first hand. Of course I could have done a mock-trade, a paper-trade or any other applicable simulation but would I fully understand the implications? Of course I would but it always sinks in better (with me at least), when “I do it”. 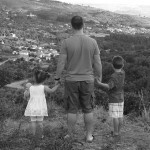 Experiences last in your memory and experts say they influence future behavior. I may be able to argue that I wanted to “experience” the decay first hand so I would avoid these garbage products in the future and stick to products with less decay and daily expenses. I wanted to overcome my allure to the “3x” aspect of these products. What’s wrong with a 40% gain? Nothing, I’ll take that gain over any 4 week period but in this particular case, the product did not provide a 3x return so I was robbed. A true 3x gain would have been closer to 80% but I knew, full well, going into the trade that substantial decay would occur if I held more than one or two days. 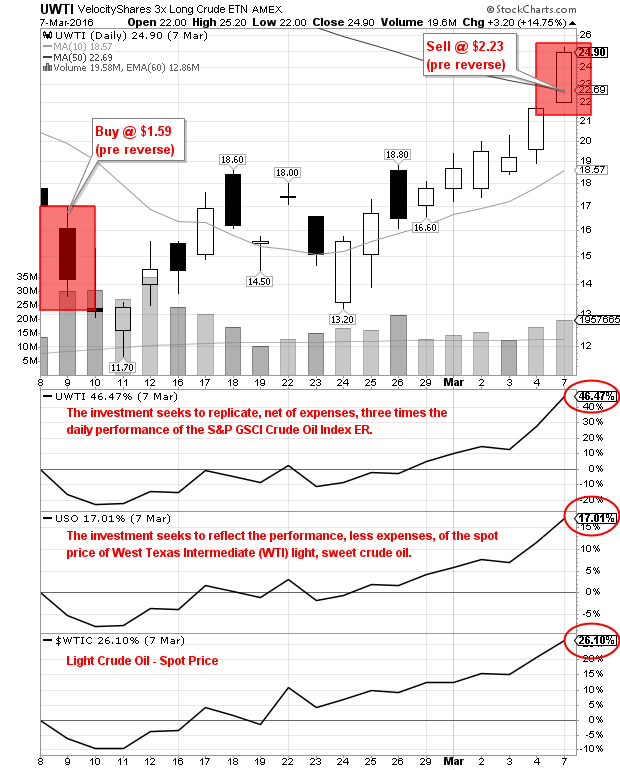 The investment seeks to replicate, net of expenses, three times the daily performance of the S&P GSCI Crude Oil Index ER. The index comprises futures contracts on a single commodity and is calculated according to the methodology of the S&P GSCI Index. – Yahoo Finance. These results occurred during the same period (NOTE: WTIC was up 46.47% during this period as my entry and exit was not the exact open and close on 2/9 and 3/7). 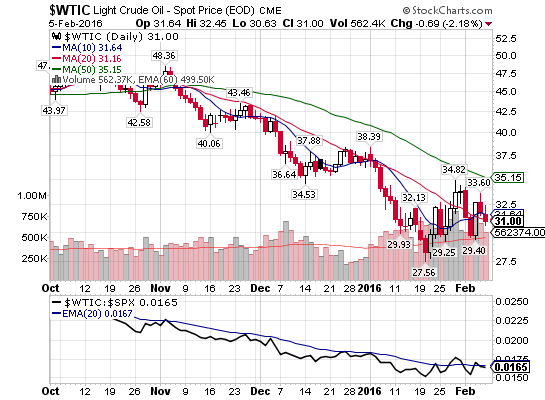 Oil ($WTIC) will bottom out somewhere in the $20 range (when, I don’t know). OPEC is flooding the market with hundreds of thousands of barrels each day to force the price down to the point where most if not all American companies are forced to cease operations. The bankruptcies are already piling up from 2015 and will accelerate in 2016. 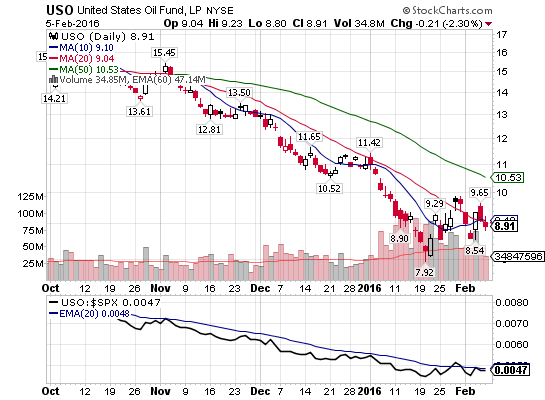 Once the majority close shop, OPEC will pull back production and the price will increase (perhaps rapidly). As it stands today, most American shale companies require crude to be at $60 per barrel to stay profitable. The leaders are getting by, by using efficient methods but the break-even point is still well above the current price level of crude oil. Another thing we should watch is the proxy war between Saudi Arabia and Iran (hat tip to a friend on this perspective). 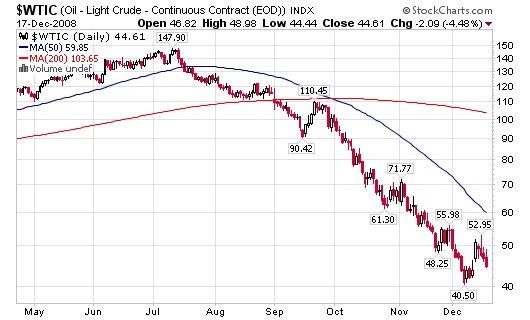 When Iranian crude comes on-line, prices will drop again. Maybe that sends prices below $20 (unless already priced into the market, which it probably is). The United States and Russia will be squeezed tremendously, the question is, will the US bail out or prop up their oil companies (my guess is no, as that would be highly political, being oil companies). When gauging public opinion: propping up GM in 2008 is a lot different than bailing out the “big bad (& rich)” oil companies. 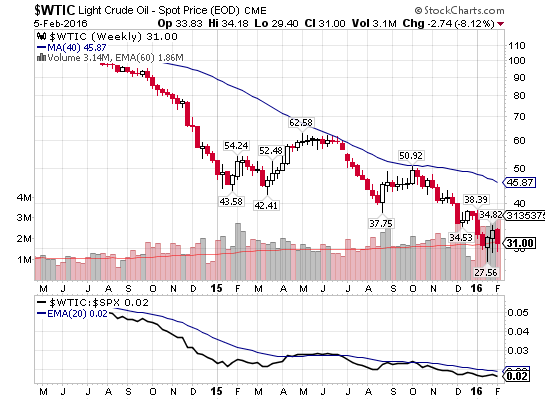 Bottom line: oil is not at the bottom yet and prices can drag along the bottom for a long, long time. 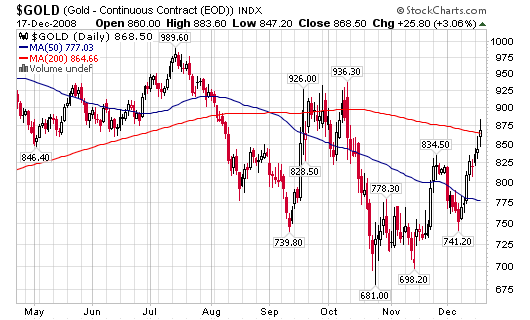 But in the end, oil will come back up (it’s a matter of how long will that take). We just need to find the best vehicle to place this trade at the right time. Do we do this using ETFs, leveraged ETFs (short term), futures, specific equities, etc. Perhaps a combination of all of them, depending on the time frame of the trade. 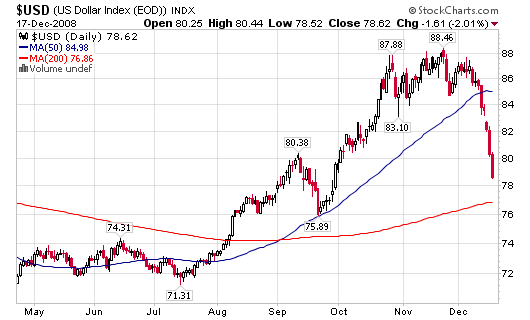 I have blogged and twittered about DXO for almost eight months now and nailed both the entry and exit points of the trade. I really nailed the exit (lock in gains) for the twitter community even though I sold earlier. I tweeted the day before and the day after the ETN topped and told everyone that it was a good idea to lock in gains “here”. 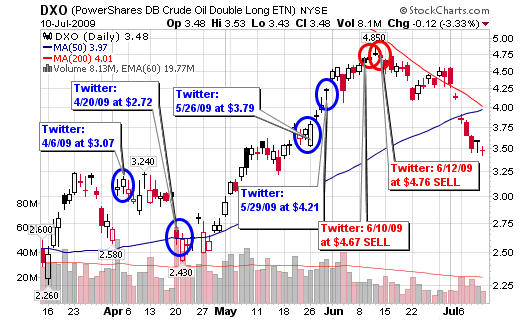 Take a look back at the tweets and view the chart where I was making calls on DXO. See, twitter is valuable when people use it correctly. Who says charts don’t work? 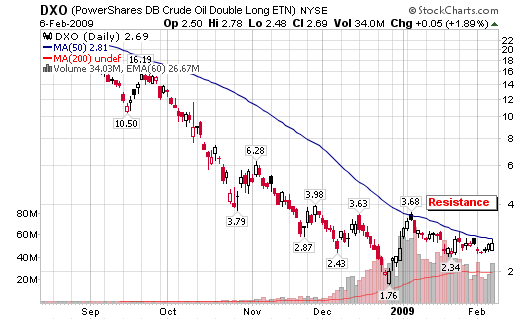 November 26, 2008: Oil a Value Buy? I grabbed shares that represented 25% of my typical position size so my risk is greatly limited but I am looking to add shares, only this time with an official buy signal…the current charts are showing that potential with a jump above the moving average or a breakout on the point and figure chart. 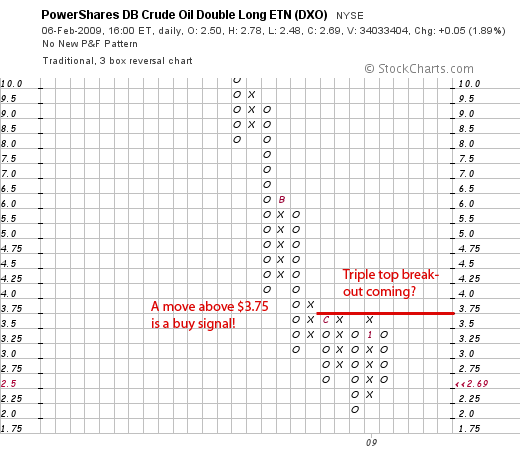 A strong move above $3.75 on the point and figure chart will be a major buy signal, especially if it is accompanied with heavy volume. 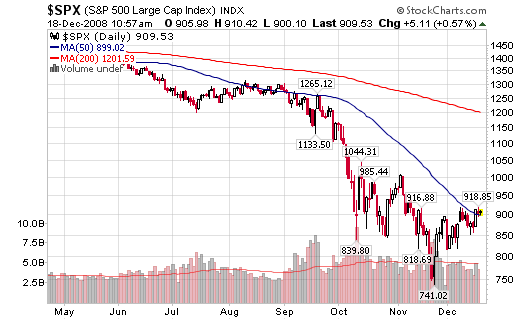 I’ll be honest; it might be too early (still) as the chart could drag along the bottom of the moving average for months before it decides to pick a direction. 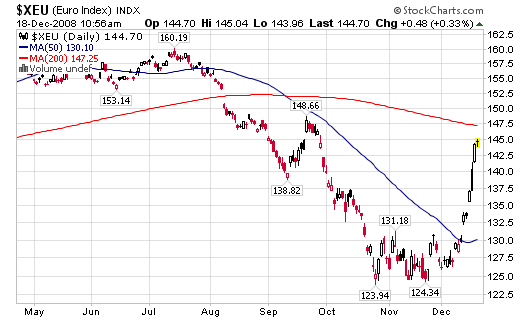 However, when it does, I’ll be ready to pounce and add shares to my first position. Let’s wait and see but don’t let this one off of you watch list. It’s still the trade that intrigues me the most. 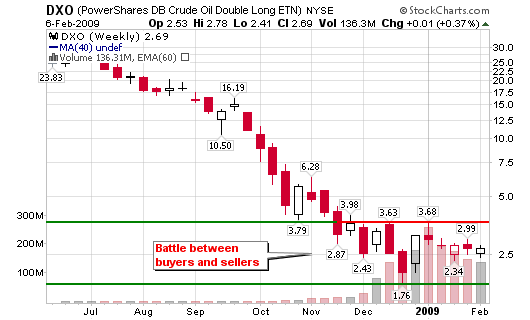 The official buy signal that we look for on this blog has not triggered so yes, I am playing with fire. I considered the position a “value play” in December and that is the truth but I also admit that I have not followed my traditional rules of entering a position. I grabbed shares that represented 25% of my typical position size so my risk is greatly limited but I am looking to add shares, only this time with an official buy signal. I did not get a signal to enter DXO but the current charts are showing that potential with a jump above the moving average or abreakout on the point and figure chart. A strong move above $3.75 on the point and figure chart will be a major buy signal, especially if it is accompanied with heavy volume. Buyers and sellers are struggling to take control of the commodity as the economic turmoil attempts to give us some type of direction across all markets. What is a point and figure chart? Click here to learn!